Shingles (also known as herpes zoster) is a painful viral infection of the nerves that results in a rash, often contained to just one side of the body. It's caused by the reactivation of the virus that causes chickenpox. Any person who has had chickenpox may develop shingles later in life. After a person recovers from chickenpox, the varicella-zoster virus remains dormant in the nerve roots. A person must have already had chickenpox in the past to develop shingles. 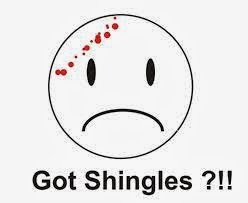 A person can not get shingles from a person that has it. However, the virus that causes chickenpox and shingles can be spread from a person with active shingles to a person who has never had chickenpox or been vaccinated through direct contact with the rash. The person exposed would develop chickenpox, not shingles. The virus is not spread through sneezing, coughing or casual contact. When an individual has shingles in the "blister phase," an open blister or sore carries microscopic copies of the virus onto the person's skin. If that person also has openings on the skin, or in the mouth, the virus can infiltrate the new host and cause an outbreak. Almost all individuals who come into contact with an active case of shingles contract chickenpox, then retain the virus in a dormant state. How Can the Virus Be Transmitted? The transmission can occur through contact with the open sores of the shingles rash. One study reported in the Journal of Infectious Diseases found that the virus could become airborne from exposed shingles sores.